Happy spring (or autumn if you’re on the other side of the world)! Despite it being a rainy, grey day here, perfect for spending indoors in jammies (which I did since I was a bit under the weather) spring has definitely arrived in the Bay Area with blossoming trees and green things sprouting everywhere. Out walking in Berkeley on a Sunday morning in a nice neighborhood, I spotted a beautiful flowering tree between two homes. I was debating with my walking buddy whether to knock on the door and ask if I could take a cutting to sketch and paint from. He thought not, since people might still be sleeping, and suggested I take a photo. But I wanted to draw from the real thing. I was trying to figure out which house actually owned the tree and he was trying to figure out how to get me to keep walking. Just then I heard people chatting, coming towards us on the sidewalk from around the corner. It was the homeowners who’d also been out for a walk. I asked if I could take a branch to paint and they said yes. This is the first of several pieces (two oil paintings and another sketch) I created from their branch. I wish I’d thought to take their address so I could send a thank you card with the image on it. Maybe my friend will remember what street we were on since he chose our route. This is the full 2-page spread in the giant Moleskine Watercolor A4 sketchbook I’m using now. It’s 8.5 x 23 inches when opened so rather unwieldy when sketching outside the studio but I’m enjoying it anyway. I drew directly with a sepia Sakura Micron Pigma Pen and then painted with watercolor and a bit of gouache. I used gouache for the background on this sketch because I wanted a fairly smooth/flat background which I couldn’t get with watercolor because of the way the paper buckles and doesn’t lie flat because of the seam. 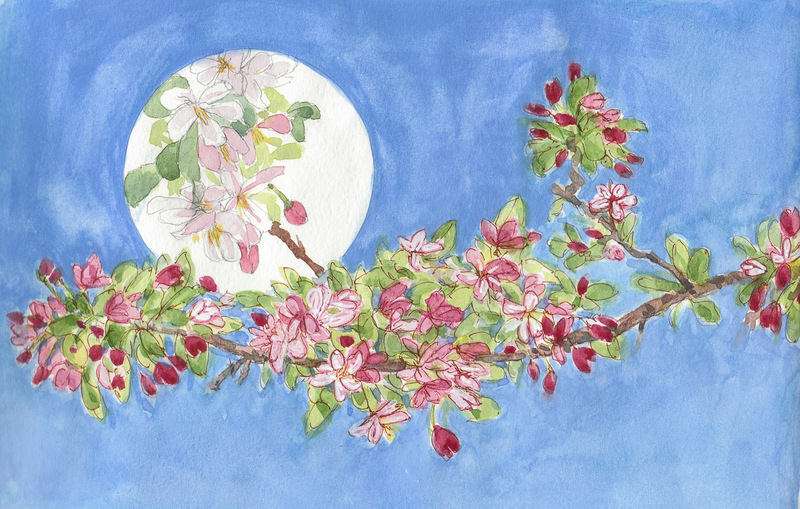 My favorite part is the enlarged pure watercolor blossoms in the white circle on the left hand side, visible if you click and then click again on the top image. I’m craving some “real” watercolor painting on good paper. Hi Jana – it was a cold, grayish first day of Spring here in Montana, so your cherry blossoms couldn’t have come at a better time – I, too, prefer your own favorite. Paint on! 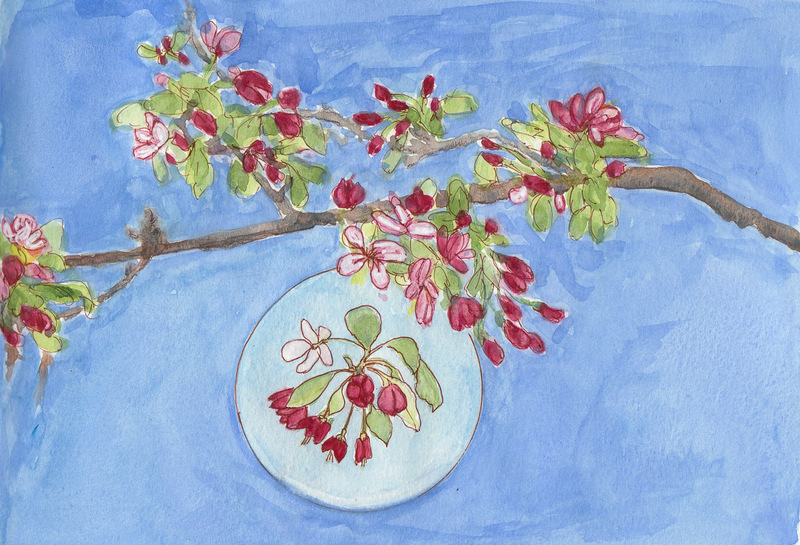 Hi Jana– how fun to take a branch back with you – paint it and then send them a thank you with an original painting! I once did that at a roadside stand giving away free tomatoes– it just makes you feel good and I’m sure the recipient would love it– I know I would! Your paintings reminded me of the scents of spring.– I know spring is coming but it’s still very cold here in PA. This is really a very beautiful, spring like painting. Don’t you love it when something like the owners coming back at that precise moment happens? Serendipity! Lovely feeling of spring in this painting! I appreciate that you mention what you are using for equipment (notebook & pens). Thanks! Happy spring. These are lovely paintings. FYI we don’t get spring or autumn here- just winter and summer… or really it’s hot and extremely hot. There is a monsoon in the south of the country, which I hope to go to this year, so 3 seasons. You get used to it to some degree (excuse pun). In summer it’s an indoors life moving from ac in house, to ac in car, to ac at work. I don’t like extreme cold either.